It’s a truth universally acknowledged that immaculate eyebrows can transform a face. Which is why we’re completely besotted with Charlotte Tilbury’s brilliant Brow Lift – a hard-working 3-in-1 product to shape, lift and define your arches flawlessly. If you need to streamline a bulging make up bag (who doesn't?! ), look no further than this miraculous multi-tasker – it's everything you need to achieve enviable, model-worthy brows in moments. 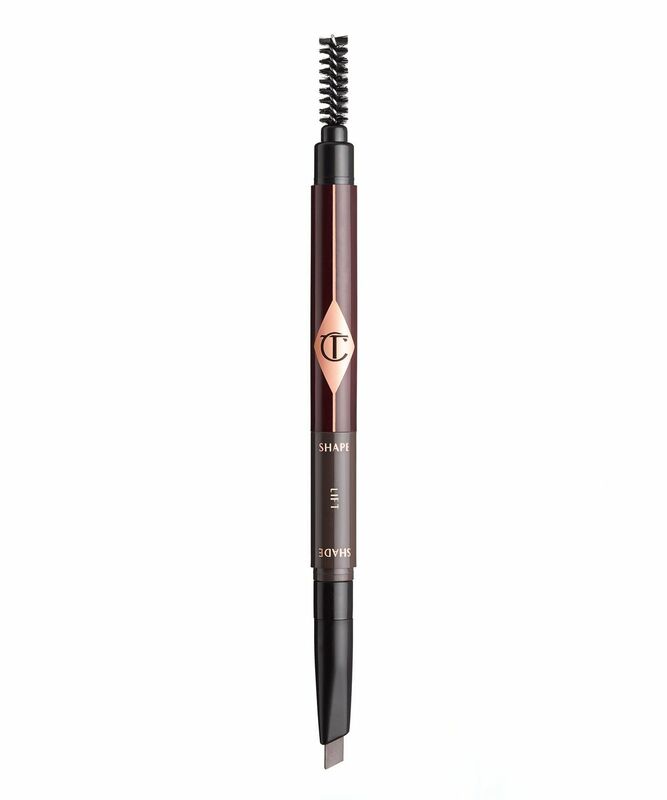 This very-clever 3-in-1 brow pencil is your one-stop-arch-perfecting shop! With a spooley wand to brush-up and tame strays, a highlighter to achieve a more 'lifted' look and a creamy pencil which works to mimic tiny brow hairs for a realistic finish, this comes in a choice of five shades (all named after the most-famous eyebrow icons): 'Grace K' (Kelly) for light blondes, 'Rita' (for darker blondes), 'Brooke S' (Shields) for dark blonde/medium brown locks, 'Supermodel' for brunettes and 'Naomi' for dark brown or black hair. Your brows will look so fierce you'll feel emboldened and equipped to tackle anything the day may throw at you. Start by brushing the hairs upwards to identify your brow’s natural shape. Use the pointed end of the brow pencil to fill-in the eyebrow line using short, regular strokes to mimic natural hair. Or, for a softer, filled-in effect use the flat side of the pencil. Apply the highlighter beneath the brow arch to achieve a 'lifted' look. To finish, comb through the brows to groom. Keep the flat side of the brow cream-pencil sharp by running it across a tissue. I'm devastated that I have to be negative about this, I had such high hopes. Its not very precise, cant get a nice clean line or edge with it, I bought Grace K as I am a dark blonde but have very fair skin and found it was just too warm for me. I cant use it on my eyebrows, I wish I just kept with ABH Brow Wiz. However I have used it as a lip liner/lip contour and find it works quite well like that. Such a shame! I’ve been an Anastasia girl since the day I started to shape my brows till the day I discovered CT Brow lift! I’m blonde and got the shade Rita which is perfect for me. This pencil is insanely good plus I love peachy highlighter in between the pencil and the spooley. The quality and the pigmentation is what I was looking for. Repurchase 100%. This is the best brow product I've ever used (and I've used a lot). The colour is just right (I use Supermodel), it has fantastic lasting power, is easy and quick to use and has built in highlighter. It allows you to vary depth of colour via pressure applied and the shape of the pencil helps you craft realistic lifted brows. This is my 4th of this product, I've used palettes and other pencils in between, none of which were as easy to use or stayed put as well as CT's Brow Lift. I'm a huge Charlotte Tilbury eye and lip fan, her skincare irritates my sensitive skin quite severely. This eyebrow pencil is so disappointing. The packaging split quickly, and quickly got to the point where I had to throw it away as it became unusable. Such a shame. I'm really disappointed with this one. I usually use an angle brush with a brown eyeshadow to do my brows but was a religious user of the Anastasia Beverly Hills brow wiz and thought that the Charlotte Tilbury Brow Lift would be great but I cannot get proper definition with it and my brows end up looking like fuzzy blobs. It might just be me but I still would not repurchase. I am very disappointed in this product, I had such high hopes. The colour was perfect for my brows, but the tip of the shader kept falling out. So now I have a pencil, that I can only use to brush my eyebrows, there is also a highlighter in the middle of the pencil which I also cannot use as its run out, yet I only purchased a couple of weeks ago and have hardly used. I am very disappointed as I value this brand, but has made me think twice before buying CT again. I’ve bought several brow products and this one is pretty good...good shade and ease of application although I don’t use the highlighter bit, it’s not for me. If you want insta brows then this isn't for you. However its great for creating a natural look. My third time re-buying this eyebrow pencil; really easy to use and great for creating both a natural and strong brow. The highlighter in the middle is also so pretty, only issue I have with it is that it isn't as long wearing as as a pomade but worth it as it's so much faster to use. I think I've landed in heaven. After years of trying to make up my sparse eyebrows with pomades, magic pencils and rather (dubious) tinted potted stuff, there never was anything like this! From the moment of putting on the brow lift, I saw the most realistic looking eyebrows - even the colour (blonde) looked amazing. Thanks Charlotte Tilbury.